This week, one of my A Year With My Camera students described in our Facebook group how he aspires to take high key flower photographs like Mandy Disher. Amateur Photography magazine published a fantastic piece from Mandy where she describes her set up, lighting and gives plenty of tips (click here to read the post). My student was not getting the results he wanted, so I had a go at following the tutorial, and have found some detail is missing at the editing stage. A Year With My Camera is my free, online beginner's photography course. Critical steps at this stage: rock solid tripod, self timer, counterbalance to stop the tripod tipping over, no direct light on the flowers, even top light (in this case daylight + reflector). Make sure your camera is directly over your flowers, and the sensor exactly parallel with the lightbox. Mandy uses a 100mm macro but mine is off for repairs so I used the 50mm end of my 50-140. I played around in editing with this image but couldn't get the hyper-realistic detailed finish that Mandy produces. I found I had to use HDR to be able to hold detail in the highlights whilst still manipulating the shadows. High Dynamic Range photography just extends the range of tones beyond those that your camera can deal with in a single image. 1. Take 3 images: one at a mid range exposure, another at +1 stop and the last at -1 stop. Use manual mode or aperture priority - you don't want the aperture changing between exposures. Do not move the camera or subject between exposures. Most cameras have exposure bracketing as a built in function where you set your + and - stops, and then one press of the shutter takes all 3 shots for you. 3. Find the HDR file (in Lightroom it is often saved at the end of the current thumbnails - you might have to scroll to find it). 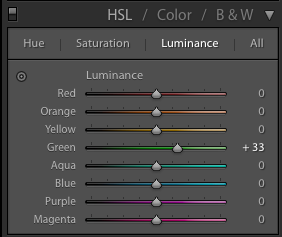 You will be able to make much more aggressive edits because the image file now has all the highlight information from one original photo, mid tones from another, and shadows from the last. You can now edit each range of tones without losing information from the others. I've put screenshots of the Lightroom edits I made in the short slideshow that follows. In particular I ended up with a huge amount of sharpening - much more than I would ever normally use. I thought I would be able to get the look with just the clarity slider, but that didn't work. The edits I made to the green slider were to reduce the oversaturation and lighten the green tones of the stems slightly. Get a free email every Thursday for an entire year, and take your photography from cautious to confident.